We are certainly getting busy with preparations for December! It is hard to believe that we are already at the end of November. Christmas concerts, Book Fairs and Christmas Angel donations are soon to begin! Our students continue to do excellent work with their learning. Our Action Plan for Learning this year is focused around literacy and Zones of Regulation (social-emotional learning). 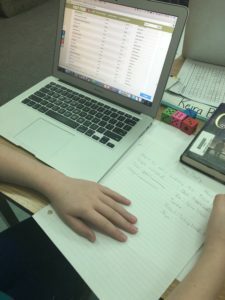 To learn more about our work around balanced literacy to support our Action Plan for Learning, see our blog post here. 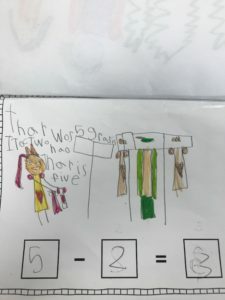 While we continue to focus on balanced liter acy through reading and writing instruction, the revised curriculum really allows teachers to do instruction in a cross-curricular approach which means teachers can blend together various subject areas to support multiple concepts in-depth (example: writing math stories with words, numbers and visual representations). 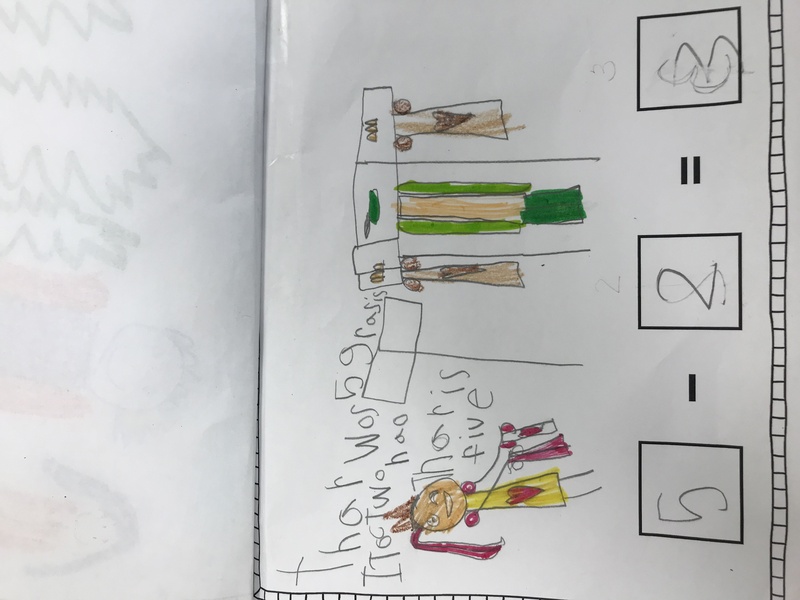 Even in our grade one classes, students are working hard with literacy-infused numeracy! Our grade 4/5 students also worked to create real-life math scenarios by planning, shopping and budgeting for a birthday party. Exploring and creating with literacy infused math is a key factor to student engagement and success! At James Hill Elementary, we work hard to create a caring community of learners. Our three main goals are: Be Kind, Be Respectful and Be Safe. This week, we have been teaching and reinforcing these universal expectations with all classes. We are actively looking and listening for JHE students who are demonstrating kindness, safety and respect! We are so impressed with the incredible students in our building. 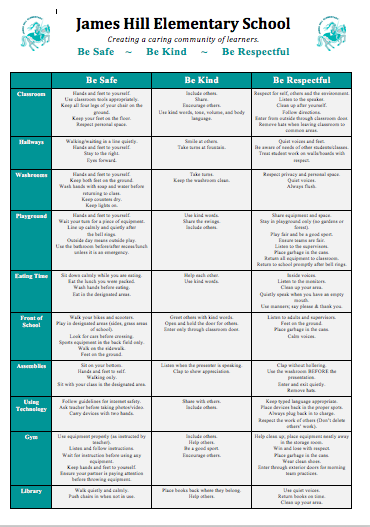 Our Behaviour Expectations Matrix can be found here: JHES Behaviour Expectations Matrix 2018 in case you wish to support this common language and these positive behaviours at home as well. 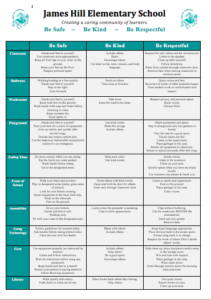 Over the next few weeks, all staff will be watching and listening to “catch” kids being kind, safe and respectful! We look forward to encouraging these positive behaviours around the school and on the playground! School Cash Online has Launched! The Langley School District has moved payment collection to an online system. School Cash Online information letters will be going home with your child this week. Once you have signed up, you will be able to pay for field trips, school fees and other activities directly from your bank account or by credit card. Please take a few minutes to set up access and then you will be ready once there are items to pay. Sign up for automatic e-mails to be notified when there is a new school expense due. Also, sometimes other schools have public items and events that are made available to all families throughout the district to purchase. Our Christmas Concert: Caroling Christmas will be on Thursday, December 13 at 1:30 and 6:00 pm. A notice went home early this week with the youngest child in each family for Christmas Concert tickets. Tickets are $1 each and all proceeds go to support our James Hill Christmas Hampers. Please note: there is a limit of 6 tickets total per family in order to allow all families to watch the show! Our tickets have been in HIGH DEMAND and as of Thursday morning, the evening concert is currently SOLD OUT. We still have plenty of tickets remaining for the 1:30 pm afternoon concert! Tickets are allocated on a first-come/first-served basis. If you require more tickets, please leave your name at the office and you will be placed on a waiting list. We want ALL families to be able to see their child perform and will do our very best to accommodate everyone. If you will not be using all of your tickets, please let the office know so we can give them to another family on the waiting list. Tickets will be sent home with the youngest child on Wednesday, December 12. At the concert, we will be opening the doors 30 minutes prior to the show (Afternoon GYM doors open at 1:00 and evening FRONT doors open at 5:30 pm). Once doors open, seats will be on a first-come/first-served basis. To ensure fairness for all families, we are not able to permit families to save seats earlier in the day. Thank you for your understanding and cooperation. Just a reminder that photo retake forms are due in the office by Tuesday, December 4. They can also be purchased online. Due to Book Fair set up in the library next week, our Marvelous Mornings will be canceled until the week of December 10. Thank you for your understanding. Please feel free to join us in the Breakfast Club each morning! This event is ran by Parent Volunteers – we need your help!! Pick an Angel off the tree in the school foyer and buy a gift for a child in need from our James Hill community. Please do not take an Angel unless you are absolutely sure to buy a gift. Please return the gift wrapped with the angel taped to the gift to the office before December 12th. please check the expiry date. If you have additional food you would like to donate, we will gladly accept it!!! Time to fill those Christmas hampers full of great food! There will also be boxes under the Christmas trees in the foyer for the food to be dropped off as well. We are also looking for approximately 8-10 frozen turkeys to be donated. If you would like to donate a turkey, please email Lindsay at jameshillpac@gmail.com. A notice will be going home on Friday about this and will explain which food item has been assigned to your child’s division. Thanks for your support ! Register if you have not already done so, then add students. When you shop at the M&M Food Market in Langley, be sure to reference James Hill Elementary at the checkout!! 5% of your sale gets donated directly to James Hill Elementary!!!! This will go on until the end of the school year. Friday, December 7: Our school will be having a Lockdown drill at 11:45 am.